It's probably no surprise to those who know me that I've already made this cake. Even though it hasn't even been a week since Fall officially started. I am absolutely obsessed with this cake. On Sunday, I decided to go all out by making this cake along with my One Pot Chicken Risotto. I couldn't help myself. 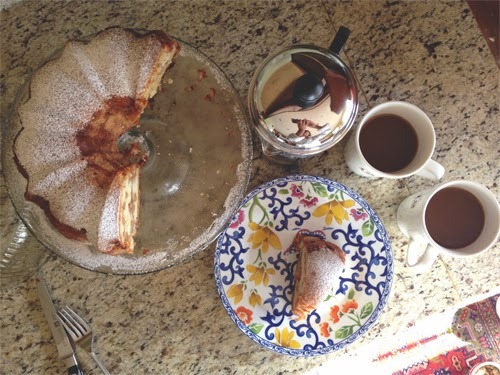 Steve was busy working on his dissertation (the bane of his existence right now) so it only felt right to make a cozy meal along with a Fall-type dessert for him to enjoy at the end of the day. Plus, I wanted to eat it too while watching the Emmys. I had this cake for the first time last year and it ranks as one of my top 5 favorite cakes. I have the biggest sweet tooth, I know, so this is saying a lot. I used to be an anything chocolate type of dessert girl, but as I've gotten older, I've developed a love affair with all fruit related desserts. Don't get me wrong, a German Chocolate cake will always be calling my name, but sometimes you just want something fruit based. And this cake doesn't disappoint this former chocolate dessert gal. Not one bit. I have Merle (one of Steve's former colleagues) to thank for this recipe. She had brought it over for dinner shortly after Cora was born and ever since then, I've made it at least a dozen times. I kid you not. I have made it for our neighbors during the holidays as gifts, and I've made it for our good friends after their daughter was born. And of course for ourselves to enjoy. It's just one of those cakes that you could eat as dessert or for breakfast. At least I think you can eat it for breakfast. I pretty much follow the recipe down to a T, with the exception that I add just a tiny bit more salt to really bring out the flavors. It probably doesn't make a difference, but I like to think so. Who's making this cake next?? Preheat oven to 350°F. 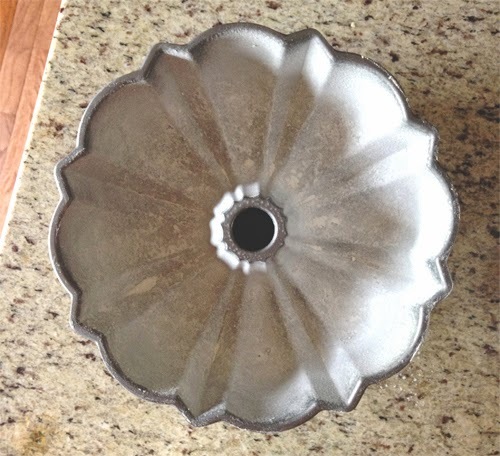 Oil and flour 12-cup Bundt pan. 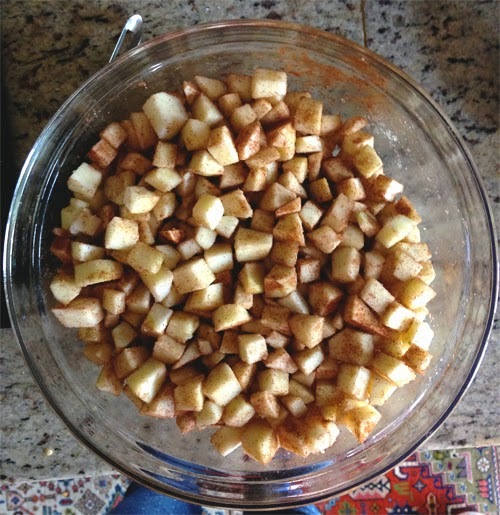 Mix apple pieces, 5 tablespoons sugar and ground cinnamon in medium bowl. 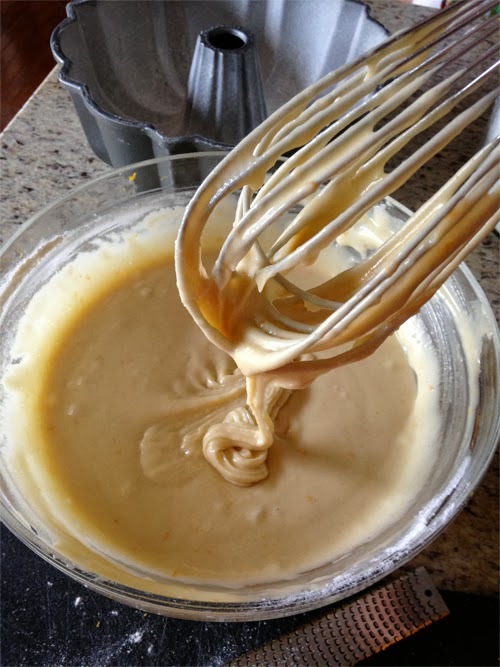 Combine 2 1/2 cups sugar, eggs, vegetable oil, orange juice, orange peel and vanilla extract in large bowl; whisk to blend. 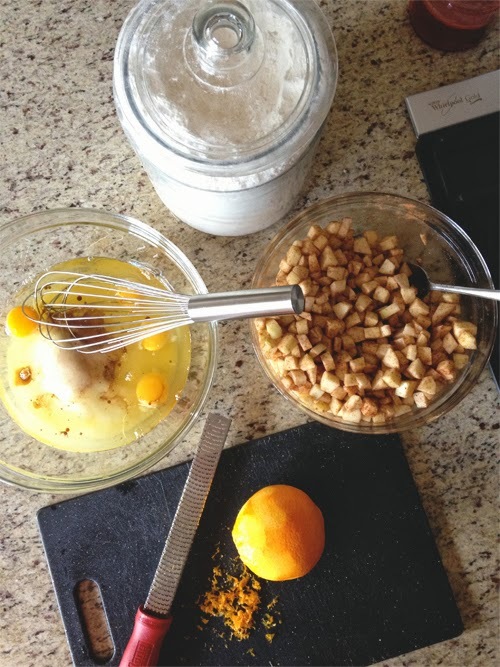 Stir flour, baking powder and salt into egg mixture. Spoon 1 1/2 cups batter into prepared Bundt pan. 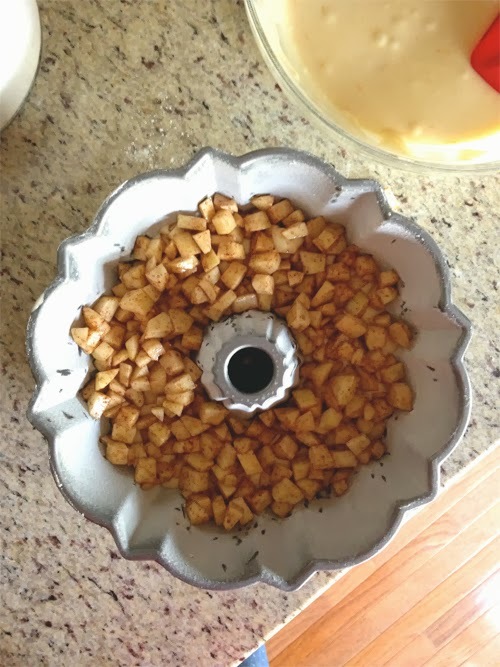 Top with half of apple mixture. 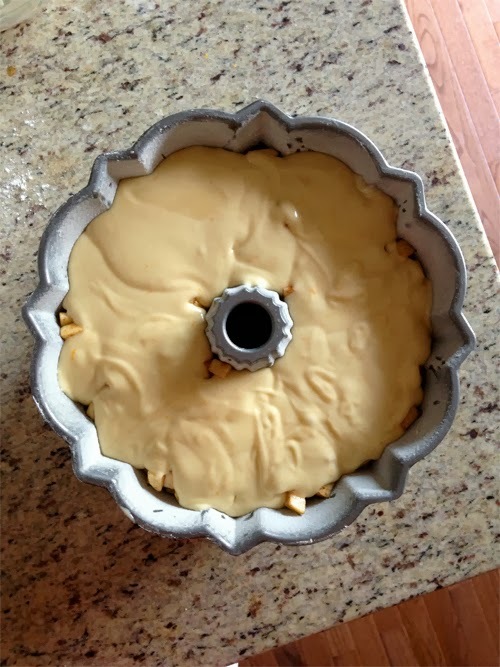 Cover with 1 1/2 cups batter. 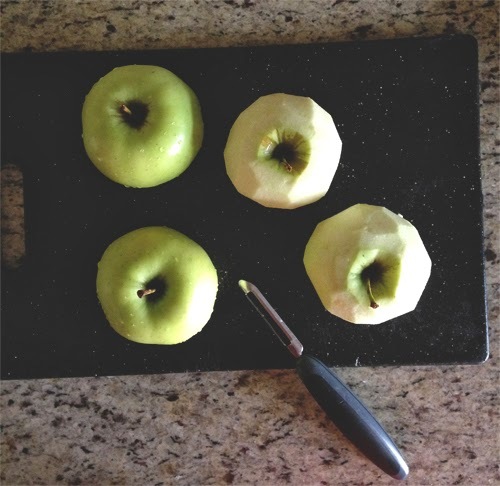 Top with remaining apples, then batter. Bake cake until top is brown and tester inserted near center comes out with moist crumbs attached, about 1 hour 30 minutes. Cool cake in pan on rack 15 minutes. Run knife around sides of pan to loosen. Turn cake out onto rack. Cool at least 45 minutes. Dust with powdered sugar. Serve slightly warm or at room temperature. I've got a few notes below so check it out! 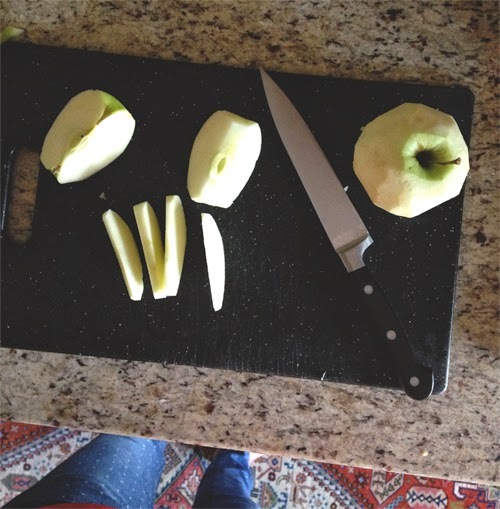 The chopping up of the apples is the most time consuming part. 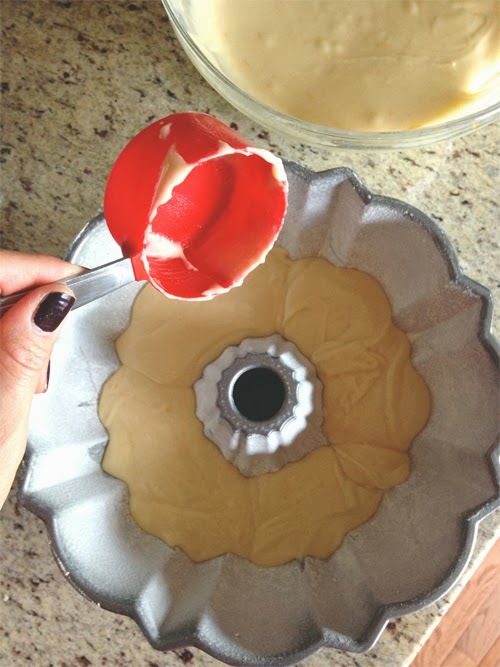 Make sure to grease and flour your bundt pan really well or else you'll have one heck of a time getting the cake out. I just used a vegetable oil spray to grease it. Down goes the first layer of batter. It's helpful to use a measuring cup so you kind of know that 1.5cups of the batter is going in. Here goes the first layer of apples. A good way to measure that you're putting in half of the apple mixture is just making sure you cover the entire surface of the batter. You know I had to Instagram this yummy goodness. 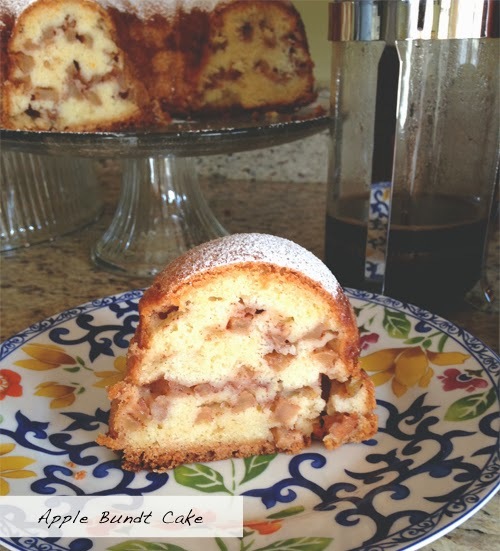 Apple Bundt Cake and French pressed coffee. My kind of breakfast right there. This looks amazingly delicious and perfect for fall! I have such a sweet tooth too and fruit desserts are some of my favorites. This would be a nice change from the apple crisp I typically make. 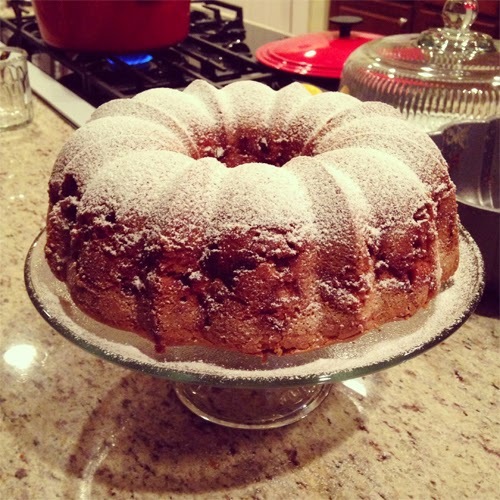 Only problem: no bundt pan. It looks so pretty though that it might be worth getting one.